Indexed in HeinOnline and CEEOL International Databases, under evaluation in EBSCO and ProQuest databases. 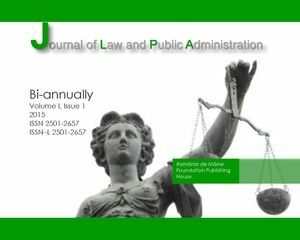 The Journal of Law and Public Administration (JoLPA) aims to build - through interdisciplinary academic studies on legal and administrative science - a solid bridge between theory and practice and contribute to the development of democratic institutions. The new journal, founded in 2015, addresses academics, researchers, practitioners, policymakers, Ph.D. students and post-doctoral scholars. The journal appears biannually and publishes scientific contributions covering a wide range of subjects including: criminal law, civil law, constitutional law, administrative law, public policy, public administration, civil rights and civil liberties, public international law, private international law, international human rights law, European Union law, environmental law, intellectual property, forensics and criminology, business law, legal sociology, history of law, juridical philosophy. True to its interdisciplinary character, The Journal of Law and Public Administration also welcomes scholarly papers from philosophers, historians, experts in economics, and others who are deeply interested in intellectual debates on legal theory and practice or on political and administrative challenges.